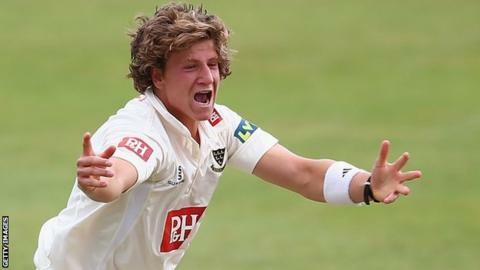 Sussex cricketer Matthew Hobden has died at the age of 22. In a statement, the club said it was "deeply shocked and saddened". The cause of death has not been given. Born and educated in Eastbourne, seam bowler Hobden made his first-class debut in 2014 and represented Sussex in all formats of the game. England's lead fast bowling coach Kevin Shine said: "His potential was huge. He was improving rapidly and I'm certain that he would have played for England." England's players are wearing black armbands on day two of the second Test against South Africa in Cape Town on Sunday as a mark of respect for Hobden, who made his final appearance in a one-day match against Essex last August. He took 23 wickets at an average of 47.30 in 10 County Championship Division One games last season. A Sussex statement read: "Matthew was an exciting young cricketer with a big future ahead of him in the game. "He was a fantastic individual who had progressed through Sussex's youth and academy ranks, having been born locally in Eastbourne. "Sussex would like to offer their deepest condolences to Matthew's family and friends at this difficult time." Angus Porter, chief executive of the Professional Cricketers' Association, said: "Matt was a young seamer with immense potential. "The PCA will work closely with Sussex to ensure that their players and coaching staff are supported during this difficult period for the club." Former England and Sussex wicketkeeper-batsman Matt Prior wrote on Twitter: "One of those days when you get a call that puts perspective on things. Live life and love everyday as much as you can! So sad! #RIPhobsy"
The England and Wales Cricket Board said it was "shocked and saddened" by the news. A right-arm bowler, Hobden was selected for the Potential England Performance Programme for the past two winters. "As a player, I remember the first time I saw him just thinking 'wow'," added Shine. "He was the strongest, most powerful cricketer I've ever seen on that programme. "He contributed to the group as much as I've ever seen a player contribute. All the lads, and the staff, loved him."